IT is facing new challenges in managing unstructured data. Organizations want to store more unstructured data and keep it longer for future analysis. However, the protection and retention methods of traditional backup and archive solutions are not keeping pace with new volumes of unstructured data, nor are they able to meet new business expectations. Given the growth in terms of quantity, total capacity, and criticality of unstructured data, IT needs to fundamentally change how it protects, manages, and leverages unstructured data. Join Storage Switzerland and Igneous for a live webinar, where we will dive into the results of a recent survey on the impact of unstructured data management and its challenges on organizations. 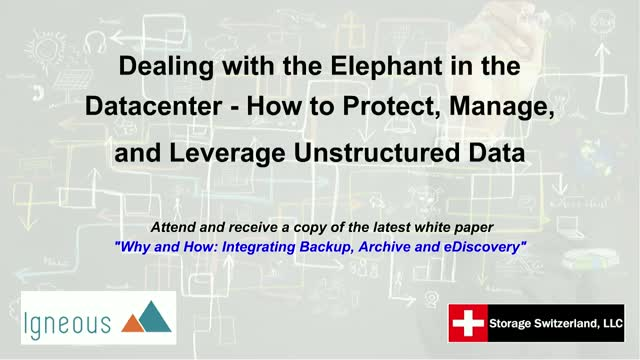 During the webinar, we will discuss best practices that organizations like yours can implement to effectively manage the unstructured data elephant.